I have been having a problem with the wifi connection on my iPad. After much research online, I have narrowed it down to an ip address lease renewal bug. The iPad drops connection when the ip address lease expires. My question is: how do I assign a static ip to the iPad based on its MAC address? And how to I find out what these values are? I know that I need to pick an ip address above the 'DHCP range', and I know what this range is. But I don't know how to tell the router to assign a static ip to the iPad and get the relevant numbers to fill in on the above screen. If it makes a difference, my router is a BT home hub 3. I have very little knowledge of networking and would appreciate any help with this. Firstly you need to do the assigning via your Router. Normally by reserving an IP address within your IP range for a device. Using its MAC address. *Without knowing what your Router Model is no one is going to be able to tell you in accurate detail. There is also the issue of being able to do this if you router is configured by your provider and if they give you the options to do this or by pass they standard idiot proof settings and go to Advance settings. 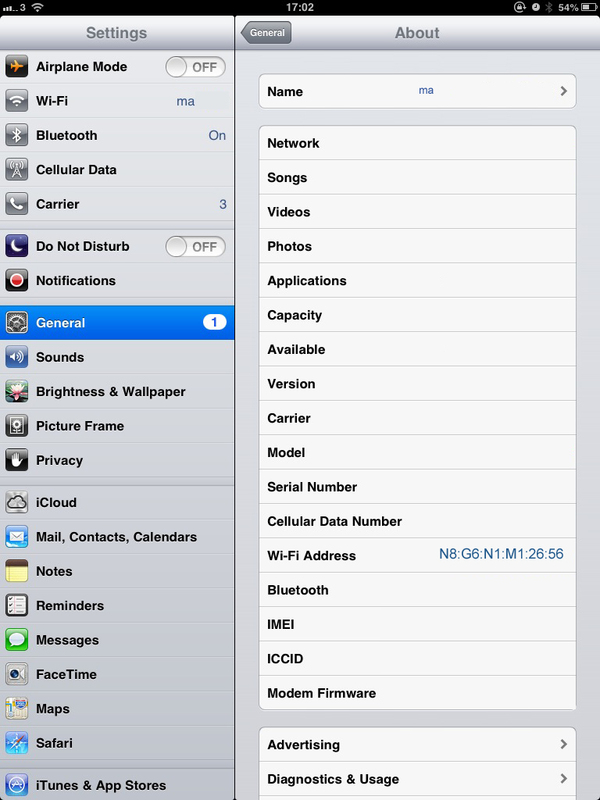 To get you wifi Mac address from your iPad. There you will see the Wi-Fi Address which is the MAC address. Not the answer you're looking for? Browse other questions tagged ipad network wifi ip . Static IP address per wifi connection? Configuration in router doesn't seem to take, am I doing it wrong? How to connect to modem setup as bridge through Airport Extreme?